Property 3: Just Listed!! Clean, Space, Style, Sleeps 11!! Property 4: Space and lots of Comfort with 2,400 sq ft! Sleeps 11! Property 11: NEW! Updated Edmond Home w/Patio & Yard Near OKC! Property 13: Big Modern Home- Edmond/OKC, Close to I-35/Turnpike. Booking now for summer! Property 14: Country In The City! 6th Street Sweetness! Open Summer only, but check out nearby “Benton Bungalow”! Property 17: 6th Street Sweetness! Open Summer only, but check out nearby “Benton Bungalow”! New Listing! Beautiful Open Floorplan in Gated Community - Perfect for Families! Property 20: New Listing! Beautiful Open Floorplan in Gated Community - Perfect for Families! Property 30: Great property for families and/or business executives. Property 31: Perfect Location! Newly Renovated , Spacious, and Clean! Property 32: Private retreat in safe, friendly suburb- off of major intersection! 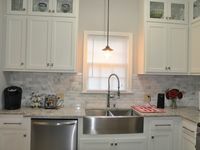 Property 34: Aurora Place- Remodeled + Close To Everything! 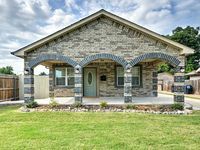 Property 41: Beautiful Modern Bungalow Oklahoma City!! This is a beautiful restored home in the Lincoln Terrace neighborhood of OKC. The pictures do not do the home justice- it is gorgeous. So many original details were kept - such as original floors, woodwork and inlayed doors/trim. There wasn&rsquo;t anything we would change. The house was beautiful. The bathrooms were great. The garage apartment was amazing- perfect for one or two people also. Great location- close to midtown, gasoline alley, bricktown and the Capitol. The apartment has a view of the Governor&rsquo;s mansion and helipad! Great porch and deck areas as well. Marek was very helpful when we couldn&rsquo;t figure out a very simple lock system - it was us not the lock - but he was very nice about it! Very cordial host/landlord.